Craftables adhesive vinyl is perfect for your crafting needs. Our permanent film is compatible with all craft cutters, including the Cricut, Silhouette, Xyron, Craft ROBO, Graphtec, and more. It is a intermediate calendared vinyl, measuring at 2.5 mils in thickness. Manufactured in the United States, this is a high quality vinyl with consistent results. Easy to weed and durable, Craftables is ideal for use on tumblers, window decals, car decals, signs, stencils, scrapbooking, or any other permanent application with a semi-smooth surface. The repositionable, pressure-sensitive adhesive means the media can be moved during a dry application and lightly repositioned it until it's just right. This vinyl has a matte finish that truly stands out from the competition. Roll Size: 12 in. x 10 ft. 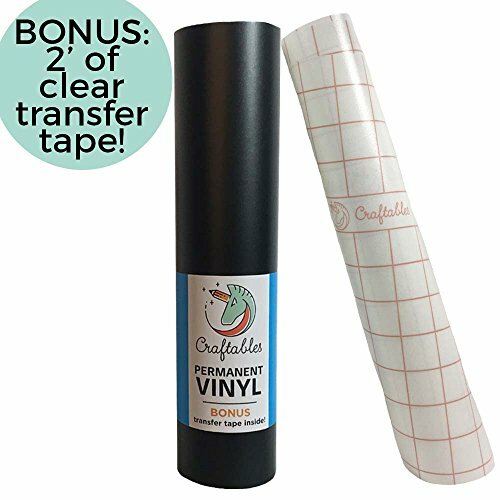 INCLUDED - 12 IN x 2 FT CRAFTABLES PREMIUM CLEAR VINYL TRANSFER TAPE WITH GRID - Compatible with all types of adhesive craft vinyl. Clear transfer tape with grid lines to easily line up even the most difficult applications. Comes on easy release liner so you can easily cut off the exact amount you need. Easy Release backing also makes it easy to reuse up to 3 uses or more! Simply place the transfer tape back onto the liner and set aside for future use. EASY TO USE | EASY TO WEED - Specially formulated vynil vinyl for Craft Cutters like Silhouette and Cricut. Easy to cut, easy to weed, and easy to Transfer. OUTDOOR PREMIUM QUALITY - permanent adhesive with outdoor durability. Great for INDOOR or OUTDOOR. 6 years+ outdoor life and 10+ years inside. RELIABLE - whether you are making a priceless gift for a loved one or making a product to sell - Craftables brand vinyl is focused on consistency and quality so you know your product will turn out great and last for years. If you have any questions about this product by Craftables, contact us by completing and submitting the form below. If you are looking for a specif part number, please include it with your message.